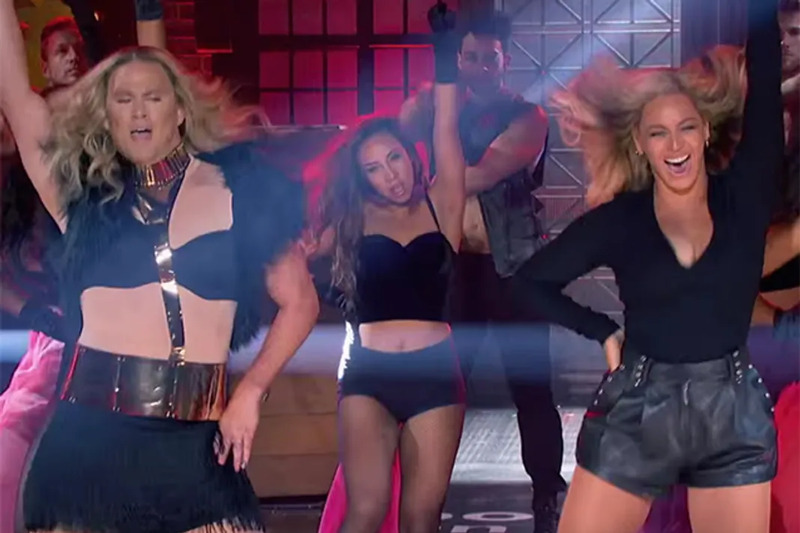 There has been a ton of hype surrounding last night’s season premiere of Lip Sync Battle. Not only did movie-star Channing Tatum battle it out against his gorgeous wife Jenna Dewan-Tatum, the Tatums (who are both trained dancers), brought out mega stars including Paula Abdul and Quentin Tarantino. Dewan-Tatum was joined onstage by Abdul for her rendition of the 1988 hit song “Cold Hearted Snake.” Later, she threw on a white tee and baseball hat to channel her hubby’s Magic Mike stripper moves. Meanwhile, Chan-the-Man pulled out all the stops as Elsa, when he recreated the Frozen classic “Let It Go” (which is apparently his daughter Everly’s favorite song). However, it was Channing’s finale that really stunned both the Lip Sync Battle audience and his wife. Mega star Beyoncé Knowles joined him on stage during his performance of her hit, “Run The World (Girls)”. Not only did Channing have the Destiny’s Child alum’s dance moves down, he also donned her signature wavy golden blowout, and a body suit. While the crowd screamed, no one was more shocked than Dewan-Tatum who later tweeted, “Got to give it up to my go-hard husband. That was epic.” With such an intense battle, it’s no wonder that the married couple shared the top prize for Lip Sync Battle winner. Check out the AMAZING video below. Lip Sync Battle airs Thursdays Spike at 10 p.m. ET.